Home » geology , history , mount st. helens , volcanoes , washington state » "This god-damned mountain doesn't dare do anything to Harry." "This god-damned mountain doesn't dare do anything to Harry." Those were the words of one Harry R. Truman. He also assured reporters and visitors to his lodge that "No one knows this mountain better than me." The 83 year-old Harry Truman was speaking of Mount St. Helens in the state of Washington: the mountain on which he lived along with his 16 cats. For two months the long-quiet volcano had slowly been stirring in activity. Geologists became alarmed by the increasing swarms of small quakes and the appearance of a bulge on St. Helens' north side: indication that lava was building up beneath. Many tried to convince him to leave, but Harry Truman refused to go. It was nothing to worry about, he swore up and down. 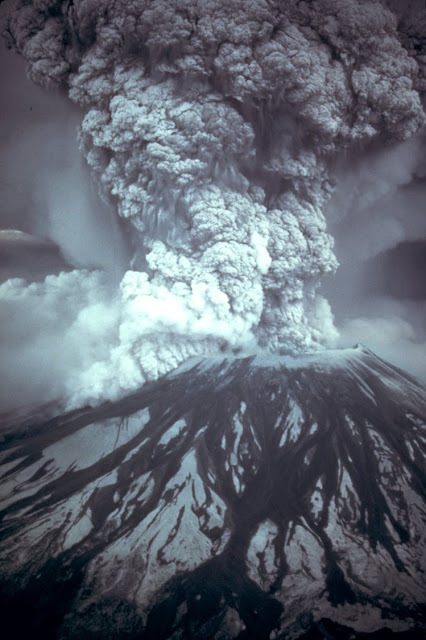 A few days later, at 8:32 a.m. on the morning of May 18th 1980, Mount St. Helens erupted. It was one of the most violent geological events in modern history. The entire northern face of the mountain was blasted away as 540 million tons of ash and debris was thrown out and across thousands of square miles. Geologist David A. Johnston was stationed six miles away. Johnston had been one of the most vocal in persuading residents to leave the area during the buildup toward the eruption. The superhot flow of ash and steam took less than a minute to reach his location. Johnston's last frantic words before his radio went silent: "Vancouver! Vancouver! This is it!" All that was ever found of David Johnston was the ruin of his United States Geological Survey trailer, discovered by workers in 1993. As for Harry Randall Truman: he and his 16 cats are still on the mountain somewhere, buried beneath 150 feet of and thousands of tons of ash and debris. True to his word, he never left. All told, 57 people died in the eruption: the deadliest volcanic event in United States history. And that was thirty years ago on this day, May 18th 1980. National Geographic has an impressive gallery of photos showing Mount St. Helens before and after the eruption. Well worth checking out. Wow. Thirty years! My sister used to work for a man who had lost a friend in that eruption.